Visitors on the porch of the restored Dunbar House. Dayton Aviation Heritage National Historical Park tells the stories of three amazing people—the African American poet Paul Laurence Dunbar and the famous innovators—and first pilots—Wilbur and Orville Wright. While we quickly recognize the names of the Wright brothers, Dunbar may be less familiar. February — African American History Month — is a great time to introduce yourself to his story. After the Civil War, Dunbar's parents, former slaves, began a new life in Dayton, Ohio. Born on June 27, 1872, their son attended school and developed a love of writing. After graduating, Dunbar could find work only as an elevator operator in a Dayton high-rise building. During this time, he wrote his first book of poetry, Oak and Ivy. His second book, Majors & Minors, became a success and catapulted him to international fame as a writer and poet. During his short life of only 33 years, he was a prolific writer of poetry, novels, plays, essays, and even songs. 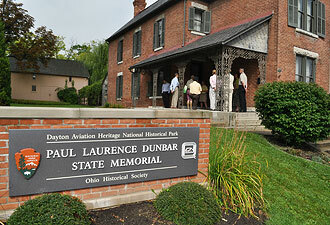 You can listen to Dunbar's poetry and catch a movie about him at the Wright-Dunbar Interpretive Center and Aviation Trail Museum in west Dayton. The center is the best place to start your visit to the national park. Here, in addition to learning more about Dunbar, you'll discover how the Wright brothers invented the airplane. Next door is the brothers' bicycle shop, where Wilbur and Orville first became interested in flight. The fourth bicycle shop operated by the Wrights, this site is the only building remaining as a testament to their bicycle business. 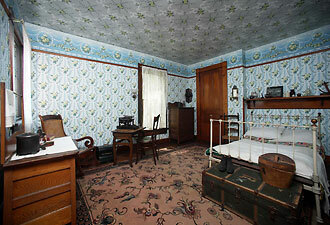 Just a few blocks away from the cycle shop, you can go back in time as you tour the restored Dunbar House. Dunbar purchased this home for his mother in 1904 and spent his last years here. Another part of the Dayton Aviation Heritage experience is the Huffman Prairie Flying Field. On this 84-acre patch of rough pasture outside Dayton, the Wright brothers learned to control and maneuver their revolutionary machine and taught themselves to fly during 1904 and 1905. The flying field is located on Wright-Patterson Air Force Base, an active military installation, and is subject to unannounced closure, so visitors are urged to call 937-425-0008 for current conditions. To get the most out of your visit, join a ranger on a tour of the flying field and neighborhood. Tours are offered during the summer from Memorial Day to Labor Day. At the Huffman Prairie Flying Field Interpretive Center, also on Wright-Patterson Air Force Base, exhibits focus on the Wright brothers' development of the world's first practical airplane at Huffman Prairie, their flying school, and the accomplishments of Wright-Patterson AFB. Adjacent to the interpretive center, the Wright Memorial on Wright Brothers Hill is a 27-acre landscape honoring Dayton's native sons. A 17-foot pink granite obelisk, dedicated on Orville Wright's 69th birthday in 1940, stands as a monument. 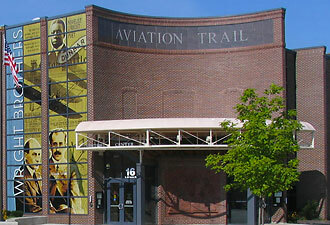 For more information, visit Dayton Aviation Heritage National Historical Park. To learn about other sites in the region related to aviation, visit the National Aviation Heritage Area. If you'd like to know more about Wilbur and Orville, check out Wright Brothers National Memorial in North Carolina, which was previously featured in our Getaway series.